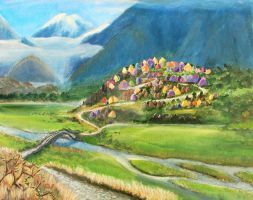 A map of Robin Hobb's other world, Gernia (from the Soldier Son trilogy). The original is a big printable version (28.7cm by 20cm at 400dpi). I won't make it available as print, but you can send me a note if you want to print it at home: if the demand is high enough, I'll put it online somewhere (I have to warn you that it's 7.8 Mb though). 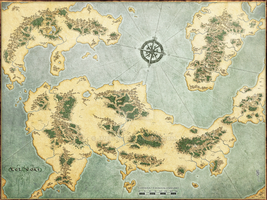 My map of the Six Duchies and Cursed Shores can be found here. How does the location of Gernia relate to the six duchies? Is Gernia far to the west of them? To my knowledge, it's not in the same world. 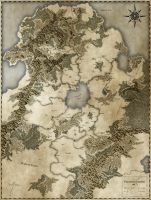 I'm always loves your Robin Hobb work, and this map is, once again, fabulous! I really enjoyed the Soldier's Son Trilogy and am looking forward for more of Robin's and your work. That's a sweet looking map. This was worth wrestling with PS over! Your land and water formations always look so natural. I'm in love with the colors you used, and how the desert areas actually look sandy, but the best is still how you suggested altitude and vegetation! And the Gernia sign fits so nicely. Oh, I love her names. so cool Crooty *_* how do u make these? First I draw the shape of the land on a separate layer with a single colour and a hard brush. Then I lock the layer transparency and with a soft brush start adding general colour areas, and finally I add highlights and shadows with smaller soft brushes. I also work with a soft brush on the background for the water. Thats interesting I was thinking you made them in Illustrator not PS. Thankies Crooty I'll try it with one of my maps. Illustrator? Are you crazy or what?